IBM scientists have made a quantum computer available to the public as a cloud service for the first time. Though the cloud service is geared mostly toward scientists and students, anyone interested in this strange new computer will be able to give it a try, Jerry Chow, one of the scientists leading the project, tells Business Insider. A quantum computer is different from today's digital computer. A digital computer thinks in two states: zero and one (or off and on). A quantum computer uses "combinations of zeroes and ones" to creates multiple states. It can be a zero, a one, both at the same time, something in between them, or it can be a mysterious zero/one state that you can't really determine, Chow says. These messy states are called "entanglement," and there are some well-known algorithms, or mathematical formulas, that use them, Chow tells us. Because quantum computers think differently, they can quickly solve tasks that regular computers can't do, such as working with billions of variables at the same time, like the interaction between molecules in chemistry. They are also great for machine-learning tasks. These computers are expected to help find new drugs, new forms of computer security, and become smart computers that can think and reason. Likewise, programming a quantum computer is different. Quantum computers are also built differently. This one uses a silicon base, like regular computers, but relies on superconducting metals like niobium and aluminum that must be kept unbelievably cold. The low temperature brings out their special quantum mechanical properties. IBMThis is the microwave hardware that generates pulses sent to the quantum processor. 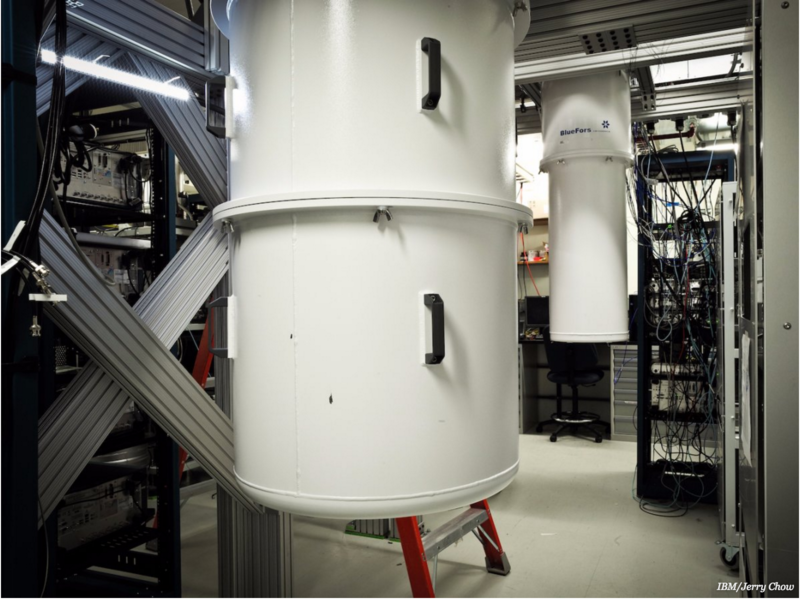 The computer behind this cloud service is a 5 quantum bits, or qubits, computer, which is powerful (other quantum computers have been 2 qubits) but not so much smarter than a regular supercomputer. The industry, however, is working its way up to a 50 qubits computer, which would be vastly more powerful than any of today's supercomputers. No one knows what kinds of problems a computer that fast and smart could solve. But there's a race between IBM and Google to find out. IBM's work is based on research done at Yale through professor Robert Schoelkopf (the IBM team is mostly his Ph.D. and post-grad students). The other prominent US school working on this is the University of California at Santa Barbara under professor John Martinis in an effort that was backed and absorbed by Google in 2014. "Google is working toward very similar goals," Chow says, describing the situation as a bit of a turf war. So score one for IBM for releasing the first cloud service. Here are some photos of the computer. IBM's quantum computer lives in that white thing. It's a special refrigerator that keeps it at almost absolute zero. This is what it looks like inside the white fridge. 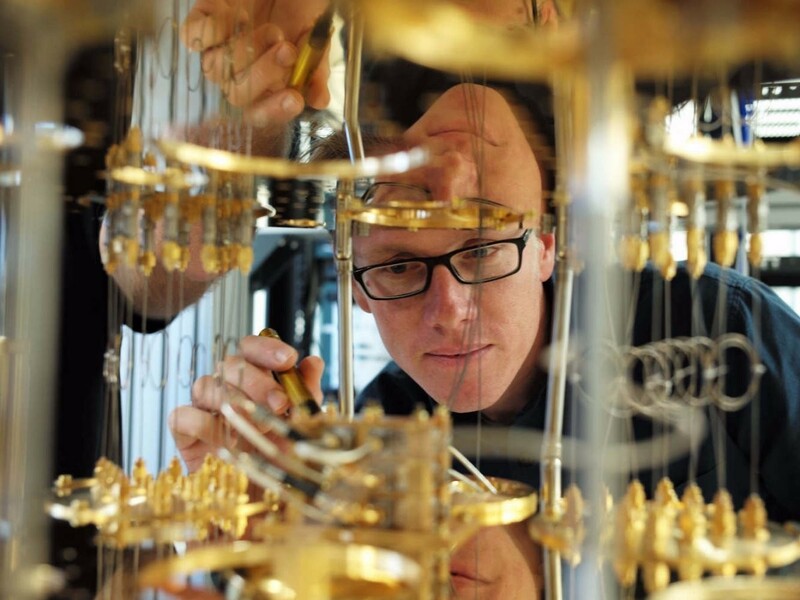 IBM scientist Stefan Filipp takes a closer look inside the dilution refrigerator, which keeps qubits at temperatures as cold as outer space. This is what the new IBM cloud service looks like. 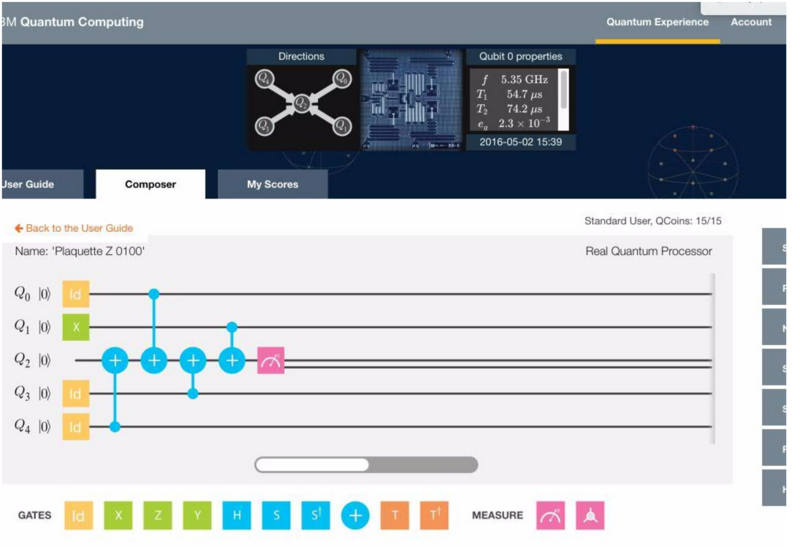 This is the software used to program the quantum computer. 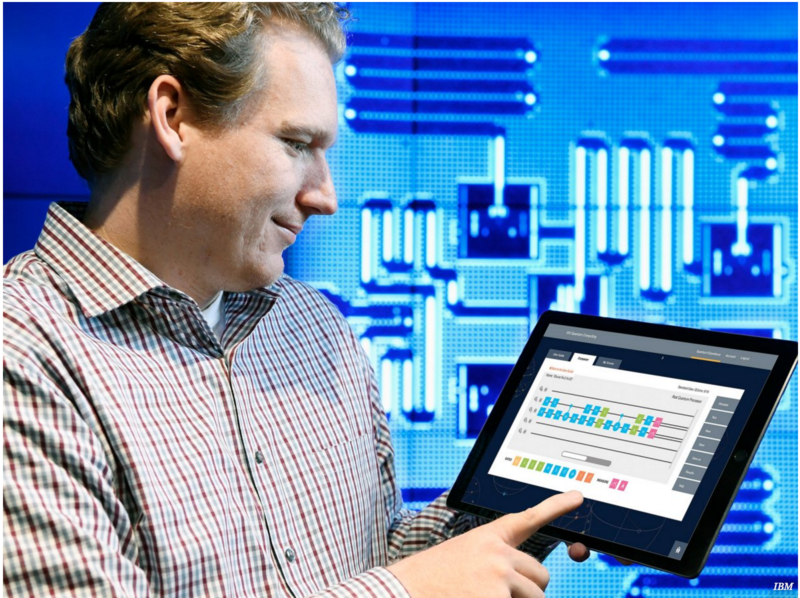 Quantum computing scientist Jay Gambetta uses a tablet to interact with the computer and new cloud service. While the power of this new computer will be big, it can be accessed from something small.